Religions have come and gone in our world. Yet, astrology has been with us in its basic form and its concepts remained valid for thousands of years, as far as can be told from records that exist about it. 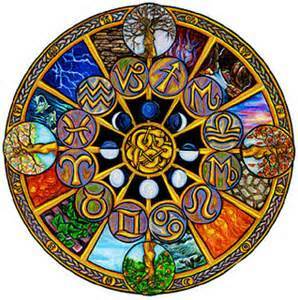 As our race progressed through the ages, astrology has become ever more enriched by the wisdom of the insights gained by those who practised the Divine art. It seems that in contrast to this, the religions of our world, from the moment of their appearance, had to remain unchanged. Designed and inspired by the Angels in charge of humankind’s spiritual development, all the religions our world has ever seen were perfect. To reveal the golden nuggets of Divine wisdom and truth, which each one of them has always brought to our world, there is just one thing they require and that is being looked at from different angle. The higher perspective is the right one. There is nothing wrong with the stories themselves and everything with the way they have traditionally been interpreted. The custom of taking every one of the surface words of the various sacred texts literally is the answer to the puzzle why there is still so much cruelty between human beings in our world, when religions have been with us for such a long time. The religions themselves never could do anything on our behalf and that includes the removal of cruelty. They cannot do this because that simply is not what they were created for. Cruelty is part of every human being’s basic character make-up and can therefore only be eradicated by each one of us ourselves. Equipped with the wisdom of hindsight it is easy to see that all the belief systems that have come and gone in our world never had any power of their own. As good examples of this as any are the Abrahamic religions, Judaism, Christianity and Islam, which have been with our world for a very long time. One of them emerged from the other and each one is a part of the same branch on the tree of knowledge of all life. Clear evidence of this is that, to this day, the Old Testament is part of the teachings of all three religions. These days it is seen as the history of the people of the Hebrew nation, i.e. of the souls who incarnated at that time into that part of our world. From time to time highly evolved souls reincarnate onto the Earth plane through whom an enlarged vision of the meaning of God and the true nature of their own being is given. Such souls come to act as teachers and guides to those whose spiritual awareness is somewhat ahead of that of the crowd; they are destined to eventually break away from the traditional teachings and form a new splinter group. One of them was Judaism, which according to one source came into being around 2500 B.C. Apparently it started from Noah after the flood, when the Creator God, whom Judaism calls Yahveh, chose a people to be the keepers of His laws; Noah’s children were its leaders. Another source says this religion began when the original covenant was made between Abraham and God, circa 1900 B.C. The legend tells us that Abraham was called at that time to leave his home in Ur. He was guided to travel to Canaan, now known as Palestine and Israel, the land that is believed to have been promised by God as their own to Abraham’s descendants. Interestingly, Judaism appeared around the time of the beginning of another New Age, the Age of Aries. Astrologically, Aries marks the point of new beginnings. When it has been reached, individually and collectively, a whole new cycle of experiences begins. Judaism fulfilled this role by bringing the idea that there is only one God into the consciousness of humankind. The legend of the Master Jesus was the next one to emerge. This was followed by the appearance of the prophet Mohammed, born approx. 570 A.D. He composed and taught the Koran between the years 610 until his death in 632. Many of its stories apparently – I have not read them myself – are parallels to the old testament; a few also to the new testament, as well as other teachings from the Hebrew and other earlier religions known at that time. Soon after he completed his teachings, Mohammed set out to convince others of his beliefs. In them he must have enlarged upon whatever he found in the old teachings that were available to him, choosing that which he felt intuitively drawn. The Prophet, the same as all other spiritual leaders before and after him, had been prepared for his role in the course of a great many previous lifetimes. Each one always worked under the guidance and protection of the Angels in charge of them and their mission, as well as the living God within them, showing the way – the same as It has always been doing with each one of us. Every new teacher added their inspiration and the insights they found into the existing material, as one does when writing intuitively. Alas, as far as it is possible to look back from where we are now, it has ever been the case that, when new understanding is flowing from the highest levels of life into the consciousness of our race, the members of the establishment refuse to accept it and do not wish to know. However, it is also in the nature of things that in spite of anyone’s resistance – no matter how bloody and cruel it expresses itself – after a while, the new teachings are taking root in some souls. In evolutionary terms they are at least slightly ahead of their contemporaries, otherwise they would be unable to recognise the value of the freshly arriving wisdom. Their grasp of it makes them suitable for acting as what is known as ‘the leaven in the bread’. As the teachers of new beliefs gather some followers around them, slowly yet another splinter group forms itself, which over time develops into a new religion in its own right. This is how Judaism emerged from some other long forgotten religious traditions. At the beginning of the Piscean Age, Christianity sprung from it in the same way, followed by Islam after a much shorter interval of approx. six hundred years.